Iraq is going to invade and destroy Saudi Arabia. They would have done it back in 1990 except for waffling by George H.W. Bush who had initially authorized the move and then rescinded approval, according to statements made by former Congressman Ron Paul, based on WikiLeaks State Department hacks. 5000 Americans died fighting Saudi paid jihadists. Saudi Arabia has always known that Iraq has only allowed them to continue their mischief so long as they served a purpose. When the war with Iran ended in 1988, that purpose had ended also. Saudi mischief in Iraq, playing tribe against tribe, pushing for Kurdish separatism and partnering with Israeli intelligence, ramped up as America scaled back her military presence under President Obama. By 2014, a logistics and command structure to destroy both Syria and Iraq had been established, headquartered in the Saudi embassies in Beirut and Amman and operating military operations centers, designed and built by the Israelis, at key locations in Turkey and quickly bolstered by satellite facilities across Iraq and Syria. The Saudi’s were feeling time getting away from them, their decades of military buildup, based on endless oil and investment performance, no longer sustainable. They had to knock out Syria and Iraq, using Israel, Turkey and NATO as surrogates, push the US into destroying Iran and cleanse Yemen of threats. They bribed everyone they got near. Were the Saudis really the ones behind the Arab spring? Do we see the hands of Saudi Arabia when Israel channels Hamas fighters into the Yarmouk Camp, outside Damascus, to bolster ISIS forces? These are the telling events few see, but they prove the hypothesis and provide what is needed to predict a future that may well no longer include the Dark Kingdom. With a world obsessed with Islamic extremism and terror threats, why is no one looking at where it comes from, who finances, whose ideas are behind it and who it serves? With fingers pointing at the Mossad or CIA and so many others, the real issue is Wahhabism and the real root of it all is Saudi Arabia. There is no version of 9/11 that doesn’t credit Saudi Mohammed Atta as planner of 9/11, whether assisted by Israeli art students or Osama bin Laden, depending on which theories you follow. The Saudis did it and American civil courts are busy now assessing the damages. il money and sovereign immunity and, oh yes, control of the UN Human Rights Council, from which Russia was just expelled, protect them also, despite their abuses and love of head chopping. What is playing out now will lead in only one direction, to a stronger Iraq, one under Shiite control with the economically powerful Sunni families, quietly migrating to their second homes in Dubai and Qatar. The crippled military the US saddled Iraq with will be gone, replaced by powerful Iranian-trained militias. The American-trained army joined ISIS. Had Prime Minister Maliki, back in 2014, been more aware of the threat, he would have moved against the Army. That, however, would have renewed the civil war, a war that could only have been ended with Iranian military intervention and Iran was still reeling with sanctions and the threat of American invasion. That threat is gone also. That world is gone, or soon will be as is being played out in Mosul and Aleppo. No one would have imagined Baghdad’s resolve or the partnership between Russia and Iran. Still in question is Turkey’s role. It is clear someone promised them Aleppo and Mosul, as is reflected in their military incursions into Syria and Iraq. If Saudi Arabia thinks Turkey will lift a hand to block Iraq’s wrath, they are delusional. Turkey knows it can have peace with Iran and that both share similar ideas about the Kurds. This far outweighs any Turkish ambitions to the South. Turkey may well be planning a new Ottoman Empire, but Saudi Arabia is not in the cards for Turkish occupation. This leaves the protection of the United States and the upcoming election. Is there any American political leader that would oppose Iraq were they to hit Saudi Arabia, by 2020 or 2021? 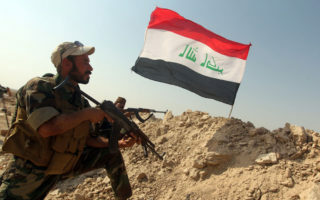 The prediction is that Iraq will come out of this war intact and, if they do, with a victorious army for the first time genuinely answerable to Baghdad and reeling from the battle of Mosul, likely to leave 20,000 civilians dead in its wake or more, the national enmity for Saudi Arabia will know no bounds. The Sunni gangsters from Anbar that aligned with the Saudis are mostly dead, many beheaded by ISIS. The promised Kurdish state in Erbil, the so-called “Barzani Sultanate” will not be handed control of the massive Kirkuk oil fields and the Ceyhan Pipeline by ISIS, as may well have been planned. Without these assets, Erbil will still enjoy a strong commercial presence but will never be able to reach into the Kurdish diaspora and bring the millions home and under questionable rule, subject to Erbil’s deal making with everyone. Eventually Erbil will become a ghost town, the sons that returned will again migrate and Turkish ambitions, seemingly undone, will be fulfilled. As it appears now, Iraq will survive. Iraq also knows that what Saudi Arabia tried twice, they will try again and that the only way Iraq can be free is if Saudi Arabia falls. And then there is Iran.